WAIST HIGH: Original Killing Joke Lineup Returns. Original Killing Joke Lineup Returns. Finally, after numerous line-up changes through the years, all original Killing Joke members have reunited for a new album and world tour. Drummer Paul Ferguson will rejoin the lineup for the first time since 1987, enabling a whole new generation of fans to see Killing Joke's legendary original formation. Diehard fans have been waiting for this moment for two decades. Bassist Martin 'Youth' Glover also steps back into the live arena after a near 15 year hiatus, having not played live with Killing Joke since 1994's Pandemonium tour. The tour will see Killing Joke take up a two night residency in most venues, offering a different set on each evening. On the first night, they will play their first two albums in their entirety, 1980's self-titled album, followed by the album What's THIS For...! Their second performance in each city will treat fans to 1994's Pandemonium and the Island Records singles of '79 to '80. Once described by Ferguson as "the sound of the earth vomiting," Killing Joke is anthemic and grandiose in it's evocation of nightmare visions. Taking a sarcastic jab at authority and perceived reality to a sonically charged mixture of post punk and metal, Killing Joke's heavy guitars and pounding tribal drums conjure a primitive atmosphere of doom, gloom, and resistance. Notorious for their use of inflammatory imagery, a backlash against a world they perceived as ever more materialistic, unjust and conservative, Killing Joke railed against the establishment and created a unique sound from their very conception. 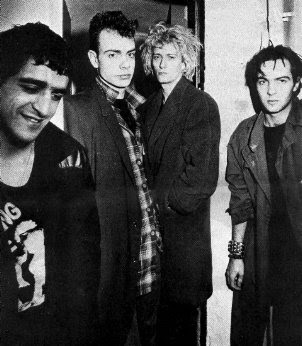 Ironically, in the current musical climate with it's obsession with rehashing eighties sounds, the '80s saw Killing Joke really pushing music forward, incorporating danceable elements with aggressive, grinding guitars and thumping drums. With elements of proto-techno rock, their post apocalyptic vision has inspired bands as diverse and influential as Nirvana, Ministry, Nine Inch Nails, Foo Fighters, Soundgarden, and Godflesh. Killing Joke have always been and continue to be more than just a band. Godfathers of post-punk, Killing Joke will return with their eagerly anticipated new album to coincide with their world tour. Album release date TBC.